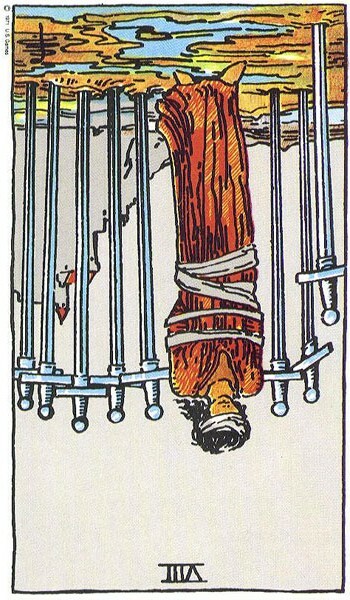 Sometimes we can get trapped in a situation that we simply can’t see the way out of (Eight of Swords). Blindfolded, we can’t see very far ahead, and we end up waiting patiently for someone or for life to come along and rescue us. But life has a way of not doing that. We often have to rescue ourselves, and if we are the woman on the Eight of Swords card, we can–we just have to get a little impatient. THAT, life can help us with–happy to do so! 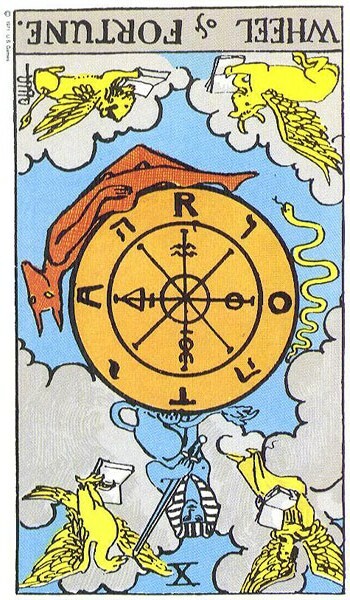 So today, along comes a nice dose of bad luck (reversed Wheel of Fortune) to increase our level of discomfort and impatience. THAT should help us to throw off those bonds and break free of limiting circumstances (Eight of Swords-REVERSED!). By the way, I love how the Wheel of Fortune card has a literacy promotion subtheme–four different protectors, all sitting around reading books. Wouldn’t you like to know exactly what they are reading? So if you want a clue as to what life actions will help you to break free, I’d say reading a book (self education or possibly going back to school) wouldn’t hurt.